Collard greens are traditionally simmered or braised, and usually paired with some sort of ham product, whether that's a ham hock or bacon. They are a staple in Southern and Soul cuisines, between which there is a deep history, the story of which is still being told today. It seems that every time I use a new ingredient, I learn something more about the cultural complexity of Southern food. To add another thing into the mix, I recently came across coconut "bacon," which piqued my curiosity. Where better to test out this funky plant-based bacon than in a "mess of greens?" A decidedly un-classic version of a Southern classic. Inspired by Coconut Bacon by Minimalist Baker. Combine coconut flakes, 1 T of olive oil, Tamari, syrup, Liquid Aminos, Pimentón de la Vera, sea salt, and pepper in a large bowl. Toss to coat the flakes well. 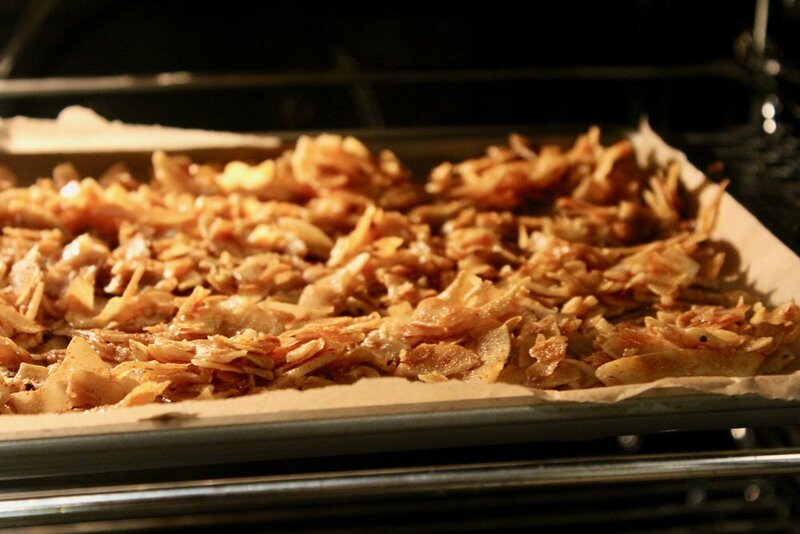 Place on parchment paper-lined baking sheet, spread out evenly, and bake for 6 minutes. Increase the oven temperature to 350, and turn the pan. Bake for another 6-8 minutes, depending on your preference for crispiness. Wash and chop the collard greens into large ribbons. Finely mince the garlic. Heat 1 T of olive oil in a large skillet. Sauté the garlic until lightly brown, then adding the collard greens. Sauté until well-softened and wilted. Serve the collard greens with the coconut bacon mixed in. You'll have plenty of leftover coconut "bacon." The savory coating gives the coconut the smoky, meaty flavors it needs to stand in for the usual flavor power player; bacon. 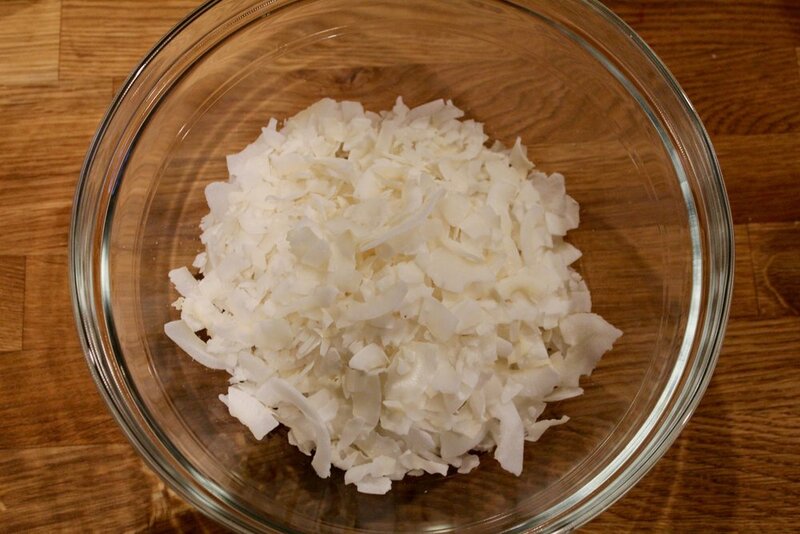 The oil helps the coconut to crisp up quickly in the oven. Once you've got a good supply of coconut bacon, the next step is the greens — sauté them well, or, if you're looking to remove some of the bitter notes of the collard greens, you can even blanch them before sautéing. Either way, make sure you get plenty of garlic into the pan, once you're ready to get them sizzling. I was surprised by how well the two mingled on the plate — the coconut's now-mild flavor paired well with its savory coating, giving up center stage to more bacon-y flavors. It even (sort of) looked like the real deal! 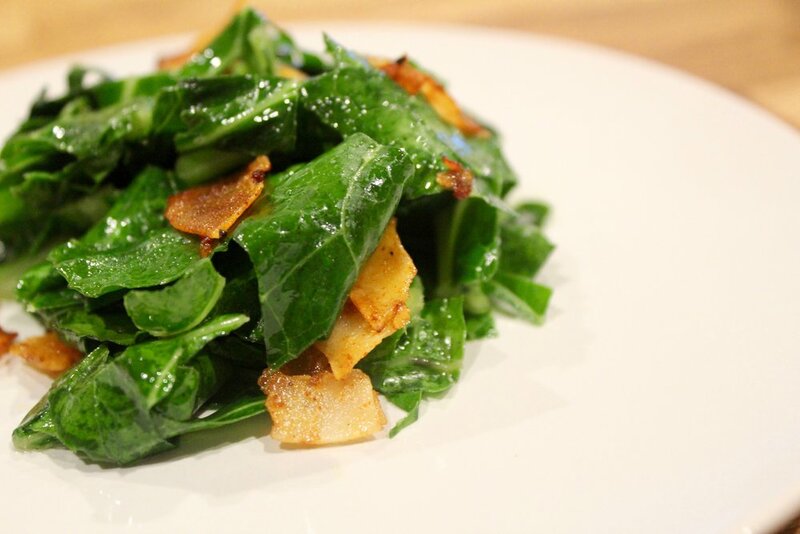 Its salty-sweetness and chewy-crunchiness gave the greens a little punch with each bite. Next step: putting coconut "bacon" on everything.